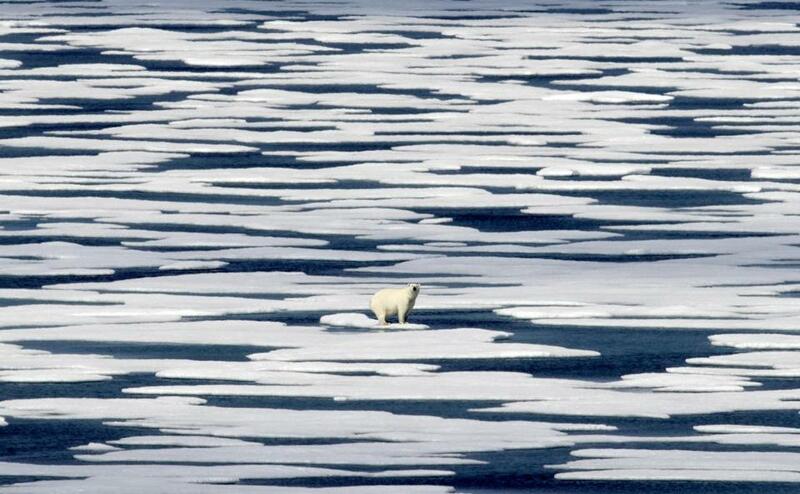 A polar bear on a patch of ice in the Franklin Strait in the Canadian Arctic Archipelago. A viral video of a skeletal polar bear crawling across the barren tundra of northern Canada, by wildlife photographer Paul Nicklen, has now been viewed more than 3.5 million times on Instagram. Taken one way, the video is pure propaganda: Nicklen, a contributor to National Geographic, is also a biologist and cofounder of Sea Legacy, a nonprofit dedicated to ocean conservation. Climate change critics caviled: fake news. And even environmentalists concede that there is no worldwide risk of polar bear extinction — yet. But it’s propaganda in service of a hard truth: Arctic ice is melting, a radical disruption that is already wreaking havoc with tourism, fisheries, and the frozen ecosystem needed to sustain wildlife like the polar bear. The damage is well documented in the latest report card on Arctic health, issued annually by the National Oceanic and Atmospheric Administration. At first, it might be easy to mistake the data for good news: After an unduly warm fall in 2016, air temperatures in the Arctic were near average in spring and summer of this year. Unfortunately, over the long term, that amounts to a blip in an unprecedented warming streak. 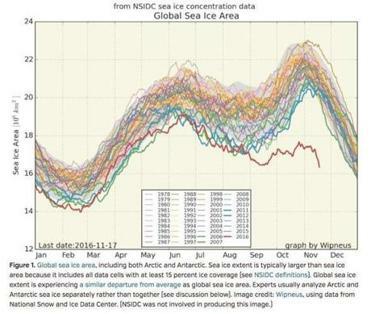 A chart showing declining ice levels at the planet’s poles sent some corners of the Internet into a mild tizzy over the last few days. Read: Is Boston ready for climate change? It’s clear that the planet’s climate is like a complex operating system, a networked web that is influenced by a variety of factors — including humankind’s activity. But in an administration led by a climate denier in chief, there’s a rare note of hope for the future of NOAA’s important work: Barry Myers, the nominee to become the agency’s administrator, came down on the side of mainstream science at his Senate confirmation hearing last month. Because Myers is not a scientist himself, many were surprised to hear him vouch for “quality, peer-reviewed, scientific research” as a basis for policy, and for furthering a much-needed national discussion on the environment. Although this page has not supported the Trump administration’s environmental policies, the government’s continued commitment to NOAA’s research — including the annual Arctic report card — is critical. The full Senate should confirm Myers, and Myers should devote his tenure to pressing for more science and less fiction when it comes to climate policy.